NEW ARRIVAL SET FOR CBEEBIES LAND AT ALTON TOWERS RESORT – IT’S A BING THING! Families set to enjoy brand new Bing and Flop live show at CBeebies Land in Alton Towers Theme Park. CBeebies Land at Alton Towers Resort is to welcome much-loved star Bing to Big Fun Showtime, in a brand new daily live show that will get youngsters bopping with excitement. From Saturday, May 26th, fans of the CBeebies series will get to see Bing and Flop in “Bing’s Picnic”, a new, live, daily show within Big Fun Show Time that sees Bing and Flop on an exciting day out at CBeebies Land. Bingsters can join them as they have their picnic, play games and make some new friends. The interactive, fun-packed performances will take place at 1.15pm and 3.15pm each day and include games for young guests to get involved with as they help Bing and Flop prepare for their theme park adventure. Following the show, guests will also get the opportunity to take a selfie with Bing and Flop. ”Bing’s Picnic” will join the line-up of daily live shows in Big Fun Show Time, an entertainment and picnic space at the heart of CBeebies Land in Alton Towers Theme Park. Guests will also get the chance to join Hey Duggee, as he tries to achieve his Big Day Out badge, and the Funsters as they encourage learning through play in a range of fun-packed activities including singing, dance, sports and more. CBeebies Land, within the theme park, is an interactive area for young children to learn and play featuring rides, attractions, live shows and meet and greets with characters from the hit channel. 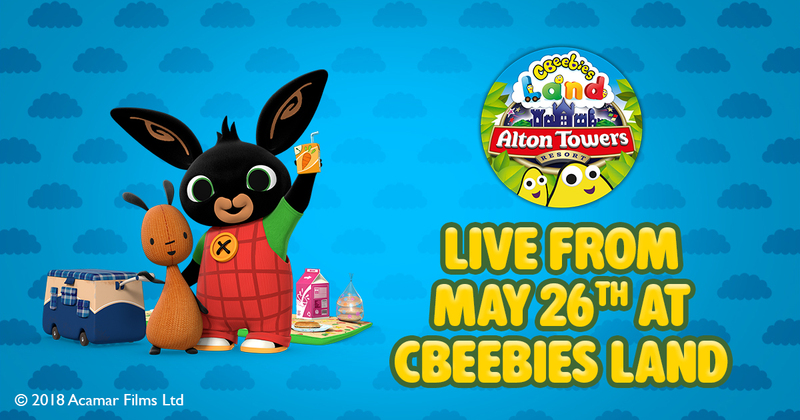 Chris Carter, Head of Entertainments at Alton Towers Resort, said: “We are incredibly excited to have Bing and Flop join their CBeebies co-stars. Bing has been a resident at the CBeebies Land Hotel since last summer and been a huge hit with our guests. Last year Alton Towers Resort opened the UK’s only CBeebies Land Hotel uniquely designed for young families, bursting with music, stories and adventures for little ones to enjoy. The Hotel has 76 bedrooms featuring In the Night Garden, Octonauts, Postman Pat, as well as Swashbuckle and Something Special. Guests can hunt for Pat’s parcels, count the jewels in the Swashbuckle room, stay in one of Mr Tumble’s starry bunkbeds or find the Pontipines around the In the Night Garden room, as well as sleep in the Octopod thanks to an underwater themed experience with the Octonauts. Featuring interactive games and play items, each themed room is uniquely designed to give little ones a sleepover like no other! Bing and Flop will appear each day at 1.15pm and 3.15pm for families to enjoy in Big Fun Show Time at CBeebies Land, within Alton Towers Resort, from Saturday, May 26th 2018. More information about CBeebies Land can be found here: www.altontowers.com/cbeebies-land. Earlier this year Alton Towers Resort also unveiled the first Season Pass for the theme park, allowing visitors to pay once and come back all season for free*. With over 50 rides and attractions, the Season Pass offers great value for money, whether you are seeking family fun or pure adrenalin-fueled experiences, there is something for everyone to enjoy. For more information, to request additional images or to discuss upcoming additional opportunities please contact: Sian Alcock, PR Manager, Alton Towers Resort – sian.alcock@alton-towers.com / 01538 704419. 2018 sees the launch of Wicker Man – bringing together cutting edge special effects with classic wooden coaster technology for the first time! Wicker Man is the UK’s first new wooden coaster built in over 20 years and joins an amazing line-up of world-class rollercoasters including Galactica, Nemesis, Oblivion, The Smiler and Rita! Alton Towers Resort is Britain’s Greatest Escape with lots of amazing rides and attractions for thrill-seekers, families and kids of all ages!